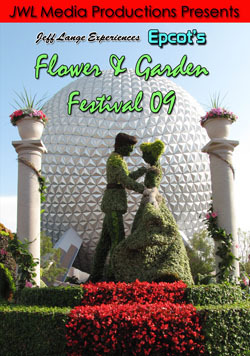 Even though Epcots Flower & Garden Festival for 2009 has ended, you can still relive the memories with a special End of Spring Combo Pack featuring Jeff Lange Experiences: Epcot’s Flower & Garden Festival 2009 DVD and JWL Media Presents Epcot’s Flower & Garden Festival 2009 Windows Screensaver/Photo CD for more information click HERE! 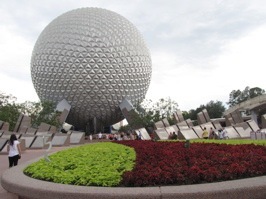 Denise from Mousesteps stopped by Epcot yesterday to see what was left from the Epcot Flower and Garden Festival. 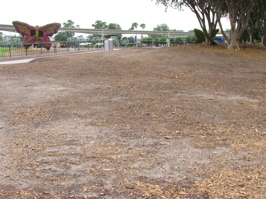 There wasn’t much left in Future World, but World Showcase still had a number of topiaries and gardens left in place. 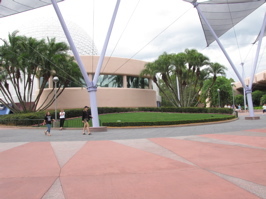 The main topiary is now down (below, left). 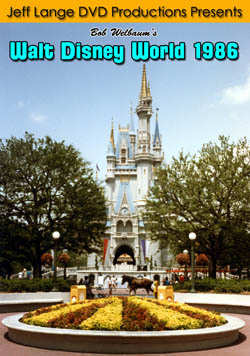 Green grass fills in where Sorcerer Mickey once was (below, right). 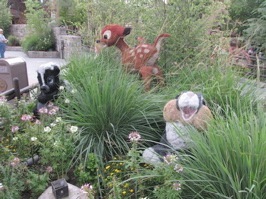 Bambi, Thumper and Flower were still a fixture in Canada (below, left). 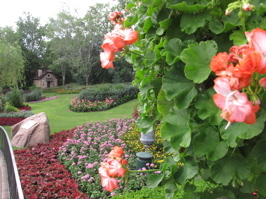 The updated Canadian Victoria Gardens look beautiful! (below, right). 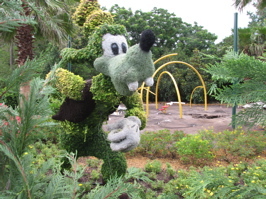 Goofy hides behind plants while the playground is dismantled (below, left). 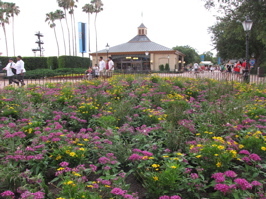 A butterfly and dirt stand where the butterfly tent and Pixie Hollow Garden were just a week ago. 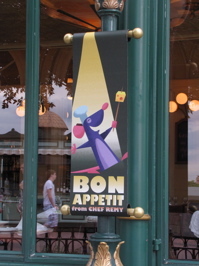 A banner for Remy. We took video and photos a couple of months ago at Les Chefs De France of this cute little audi0-animatronic (below, left)! Simba is no longer held aloft (below, right). 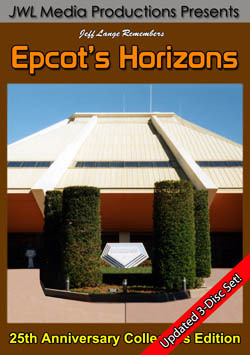 Relive the memories with a special End Of Spring Combo Pack featuring Jeff Lange Experiences: Epcot’s Flower & Garden Festival 2009 DVD and JWL Media Presents Epcot’s Flower & Garden Festival 2009 Windows Screensaver/Photo CD for more information click HERE! I was surprised to find a Fed-Ex package waiting for me when I returned home this afternoon. 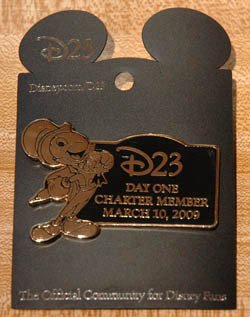 I had no idea what it was as I had not ordered anything lately so I open the padded envelope to find the following letter and charted day pin from D23! What a really nice surprise! 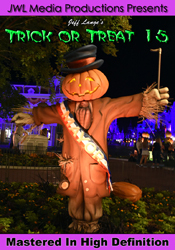 The pin keeps with Walt Disney’s philosophy of giving the people more than they expect. This is the second time I had received a free surprise from the club, in addition to the recently sent (and very cool!) 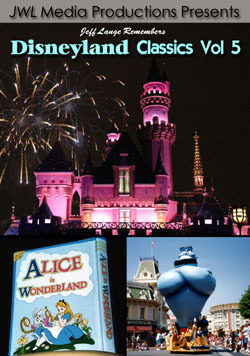 reproduction of the 1955 “Acres of Fun” Disneyland souvenir fan. 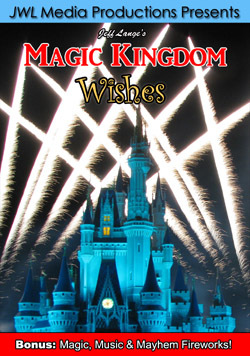 After the great time I had at the Epcot Flowers & Fireworks Celebration last week, my membership keeps giving me more value than I had expected when I joined the club. 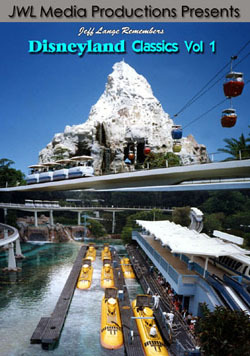 Kudos to D23 for surpassing my expectations yet again! 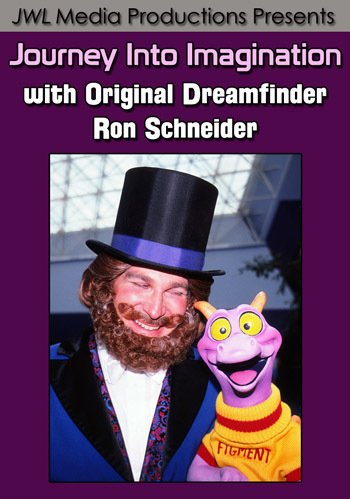 You can find my D23 event coverage HERE (I have another article at JimHillMedia HERE), and Mousesteps also has photos of this fun event HERE!